I also think that having an open and constant stream of communication is the most important thing I’ve learned during this. It’s not a lesson I personally will have learned overnight, but it certainly shifted my attention for future endeavors of this or any other nature really. Even your greatest ideas could get lost in the ocean of your silence and will slowly drift from memory. We are social creatures after all, overcoming any and all barriers that would otherwise shut you up in certain situations should be your main objective. I am appealing to you dear follower of our footsteps. Challenge authority! Ask the uncomfortable questions, stir things up! That will only open up many new interesting questions to be answered. I think that is the essence of this course. Charting your way through team dynamics, speaking up and not letting your voice disappear in the mist. Invaluable experience indeed. Kudos for setting it all up, cheers to Nancy, Alan and all our tutors. Closing in on the end and final judgment of our work, I can’t help but feel anxious in a way like a newcomer to Hollywood who was lucky enough to land a main role in the next big flick, and can’t think of anything but that the movie has to be good. Great in fact, because that nobody has put his heart and soul into this one in a million opportunity to be part of something that just has to be mind-blowing… doesn’t it? It’s that nagging question in the back of your head that against all your confidence refuses to go silent, that appendix to a boastful sentence, that manages just a little to shake all your self-assuredness. Isn’t it? We all like to believe that we have the best that anyone could’ve come up with given similar circumstances. Working in a strange new environment with only the tools given, your brains, your teams, your… communities? I still can’t honestly say that I have understood what this word actually means in this context. Is it the far-distance-relationships that cling onto their dear life against all odds? Is the great move from physical face to face interactions of a conventional workplace to the digital plains in our very own teams? I like to think that it’s all that and more. Also I’d like to state that I truly appreciate Nancy’s newly coined word ‘confusiasm’ at this stage. I’d also like to thank whoever brought the Zen principles to my attention, I can deeply identify myself with them. I’m actually considering Buddhism at this point. I’d also add oppenness to those. I’ve heard a very compelling story about inviting all manner of strangeness into our lives, and applying that has made my life richer. Communication is essential for any form of network or community. It is the fabric of which it is made. I found out that I still cannot use them. Though I am born in a digital native era, I never found technology interesting. But know I am a proud Tumblr-Blogger. But in comparison with my knowledge from before, I can say that using these types of networks are pretty handy if you are trying to work in a big group like a class. But for personal reasons or even in a company I would not wok this way. I like it oldschool with paper and pen, communicating by talking and maybe more innovative. Respect the elders, in this case the big designers and their style. Work hard, try not to be satisfied with the first draft ‘keep designing ‘keep innovating. ‘’Fortis Fortuna adiuvat’’ , Fortune helps the strong, in this case ‘’Luck is usually on the side of those who take risks’’ and by that I mean trying hard and risking will reward you. Try working in groups to achieve maximum creativity. Dear future IDE student, please pay attention in class and do not get distracted to much by the free good wifi. J But joke aside, it is very important to get the most out of the classes and do that by listening but even if you not sure about something ask immediately the teacher. And the most important thing is ‘’Time Management’’. If you do not start you work early you might end up with too much work. Try to do soething for every subject everyweek a little bit and you will be rewarded again. Looking back at all themes that we have discussed and discovered, I can tell, that when it goes to online communities and using them in innovative designing, I have learnt a lot. First of all, I got to know how they work and how useful it is to be a part of an online community. When you ‘belong’ to one, your life and work as a designer, can be easier and more efficient. You can get many information, help and support. People, who are interested in the same subject that you are, are part of the community you belong to, are willing to help, share their knowledge and experience, which may help you in creating very innovative designs. I was really surprised by the fact, that so many people use online communities and networks to improve their work. Even simple research or asking a few question to right people can give you many insights and ameliorate your design. They also help you to start with the project, to know what are your ‘ideal clients’ expectations and needs. I think that if you want your design to be succesful, it is really important to be aware of existing online communities, how important they are in innovative design and how can you use those making your designs. When it goes to design principles and adapting them to online communities, I think that the most important is to make the design simple, easy in use and nice for the eye. If the design itself has to many ‘options’ and ‘possibilities’ it may become too complicated to use, which may couse people’s aversion and they may not be willing to use those. That is why, I think that combining simple but effective project with elegant appearance is the most important. The course itself may teach you a lot. You will probably feel confused for first 4 weeks, but do not worry, it has happened before. During project community classes, you will learn how to work for a real client, how to create and design the solutions that he/she needs, but first of all you will learn how to start all that procces. What is also very important, you will be forced to work in teams, which is something, that shows how important is that you have people around you, who have the same goals but may have different ideas.It teaches you how to work not by your own, but with others, how to share ideas, agree or disagree with them, argument your rights, divide your work into every members of team, do assignments on time, be responsible for all team, not only for yourself. And that is what I will ‘take with me’ as the course ends. I am really happy that I have learnt so much and I am proud of my team and my teammates as we are getting our project done. Do not waste your time on doing nothing, trust me, start doing things, as early as possible and do not wait for answers from your client (assuming you have some) because it may never come and the project has to be done anyway. I will also focus more on the teamwork itself, at the beginning of the project, not at the end, as we have done this year. I have learnt that even though online communities can sound like just a digital space, it couldn’t be any more human. Each time we interact online we shape it, explore it, and communicate with others without time or distance being of issue. The Internet has connected us like never before and allows the individual to be empowered by information, by ideas, by a movement. I walk away with the idea that the most effective online spaces are framed with the end user in mind, operating the way someone would intuitively think. I see digital communities as a bigger version of the teams we have been operating in and have a clearer view of the communicative and operational struggles groups go through when trying to achieve a task. There are many principles of design that go into a product, however, some I feel are more important than others with regards online communities and networks. For example, accessibility, if less people can access the platform or it is difficult for them, the weaker the network is. Efficiency is paramount to achieve things within a desirable time frame and to create more results with less effort. Finally, as I mentioned before, good design makes the product understandable, for if you are not able to do this no matter how innovative or well detailed the product is, it will never be used. Before this class I never considered how useful and how powerful online networks can be and will use them in future as a valuable resource, as I hope the students after me will find also. The best advice that I can give future students is to be organized, communicative and present. Time management is imperative as the project is spread over 9 weeks, and although this seems like plenty of time in the beginning, the panic sets in as you get closer to the end. One of the biggest challenges in this class is effective team coordination so be very open about team communication from the very first day. The last and most obvious piece of advise I offer is to simply make sure that you show up to class and your group’s meetings and things will go a lot easier and smoother for you and your team. Best of luck to the new class, hope you have as much fun as we did! I find the wast couple of weeks to have been really helpful for me and as i can see to my classmates too. All of the topics we’ve been trough have their own specific benefits and all of them are going to be useful in the future. Of course I have to say which one I learned from the most and even if I want to say- the whole thing, I can’t. So I’m going to go for the thing which I think was the main one and the one which can actually define the whole picture and it is TEAMWORK. During my previous education almost all of my tasks and assignments have been personal and we barely did group ones. Considering this I can say that I didn’t have any experience with teamwork. I have noticed the benefits of it and of course some of the cons. For example I noticed that when there is a problem in front of you It’s easier to solve it as a team than by yourself, also 4 or 5 heads think better then just one. I have also seen that sometimes may be a difference in the characters and the situation can get a little edgy and some points but that’s why the other members are there to balance the difference and solve the problem. I can compere this topic to our NGO because basically they are, as well as all of the companies, a big team and in order to be successful it’s crucial for them to have a good working team. I’m also going to talk a little bit about my design principles here. I believe that any product should be simple and friendly- because it’s easier for the client to understand it and to be able to handle it and of course, why make their lives even more difficult. Secondly it should be extremely efficient because we don’t want to disappoint our clients and we would like our product to be the best of it’s kind. So now we have “simple” and “efficient”, looking at those together what we may think? BORING, or at least most of the people will think of that and we know that this could be a major problem so we are putting our best efforts in that direction. So what can I say to the next year students? This project was special because it is so early in your education but at the same time really serious but to be able to manage it easily the basic thing are to always pay attention to your task be really goal orientated and always seek for solutions. Another thing is that you are gonna be placed in teams and you should try to have the best possible communication and you have to have patience with the other members in your team. Of all the themes…teams ! All of the themes we have worked on so far have their own benefits and applicability, however I have found Teamwork to be the most helpful. It was a crucial class to have earlier on, where we focused on how we operated as a team and what our roles are within the unit. 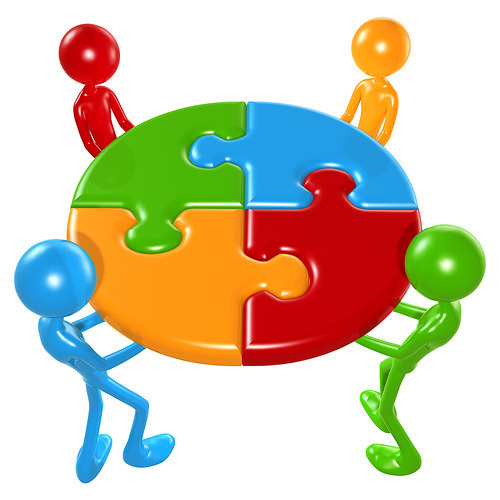 Teamwork is the foundation on which we make our ideas and must be well organized in order to progress in a project. It is much easier to successfully reach a goal when all of the individuals have set tasks, a mutual respect for one another, and a clear idea of the “bigger picture”. Each team member has their own strong and weak areas, and it is important that people are placed in a function where they can contribute the most to the group to the most extent of their abilities. All of the skills we learned throughout this team building process can be carried over to meet the needs of our NGO, for what is Solidaridad but just a bigger team? For example, we can apply the learning process we went through customizing appropriate communication methods for our own group. We explored different networks we can utilize for communication and collaboration, and played with the idea of incorporating some of them for our final product. We talked about how differences in size change the group dynamics, something to consider when detailing the needs of the rapidly expanding Solidaridad. We want to create a framework for a social platform that is user friendly, efficient and effective. We want something that is intuitive for the end user that makes immediate sense to them when they are sifting through information. This can be achieved through uncluttered graphics with clear labeling and organization to make it easy to navigate. The information can be separated in a “river delta model” where you start out more generally with the region you are interested in, then the supply chain and then make your way to something more specific. Despite all of our unique ideas and opinions, as a team we see its clear that thinking about the platform from the frame of mind of the user is the key to creating a successful social platform. A designer’s creations are only as good as the ideas behind them, and therefore it can be wise to cultivate the thoughts of others. This is hard to accept sometimes for a perfectionist such as myself, as I like things done in a particular way. Yet is undeniable how incorporating others opinions into my work enhances the final result, a synergy between the best of my ideas and others. Crowd sourcing on the consumer end can create a superior product because it has the wants of the user in mind. A small example of this is the exercise in our kickoff week where we built necklaces to the taste of our client after receiving feedback from him. Its also a simplistic solution, a relatively easy way to find guidance in a design process that can be frustratingly abstract at times. Every individual is wired differently and constructs unique solutions to the same problem, and it is after gleaning the best of multiple solutions that you can achieve a superior result. In an attempt to do this, however, including more people in the equation can cause a clash of interests and ultimately become a pitfall instead of a benefit. 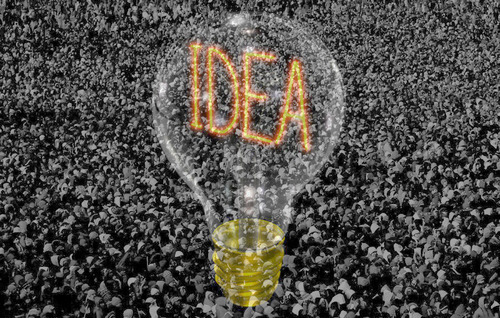 Likewise, some of the important creative ideas in society have not come from the input of the crowd, but from the mind of an individual thinking outside the box. For example, Galileo changed the way we think about the universe, and Bill Gates (not even a college graduate!) has become one of the most successful people in the world thanks to his unique products. Despite its possibly useful capabilities, the effectiveness of crowd sourcing in a project is dependent upon its nature and is not applicable to every situation. It may be more useful for a company designing a simple domestic home product to crowd source the end users than someone designing highly technical machinery for a niche market who would require more expert advice most likely. However we have found that if applicable, crowd sourcing can be a very valuable tool and it would be wasteful to leave it untapped.